This week has been a doozie. I won't rant on about the multiple reasons why, but suffice it to say, I'm happy that it's over. Girls, I am ready to ring in the weekend. On weeks like this, I'm happy for the simple things in life, aka, leggings. Since these are faux leather, they're edgier than my lived in cotton pair, but I softened them up with a comfy lace detailed top. Ultimately, on these days, I'm going for something that says, "hey, I'm trying, okay!" 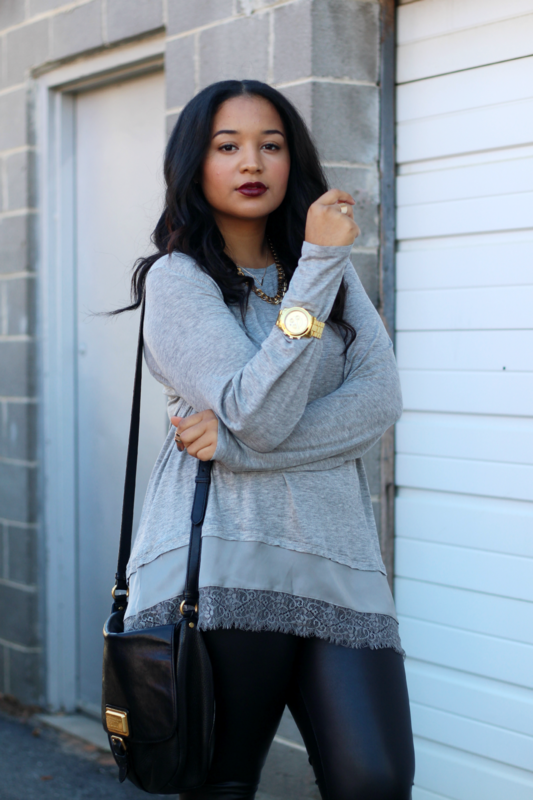 The "FAUX LEATHER LEGGINGS & LACE TRIM TOP" are c/o of Wet Seal. All opinions are my own and were not influenced by the brand. You tried and you succeeded. Love the mix of sweet and edgy of this look. 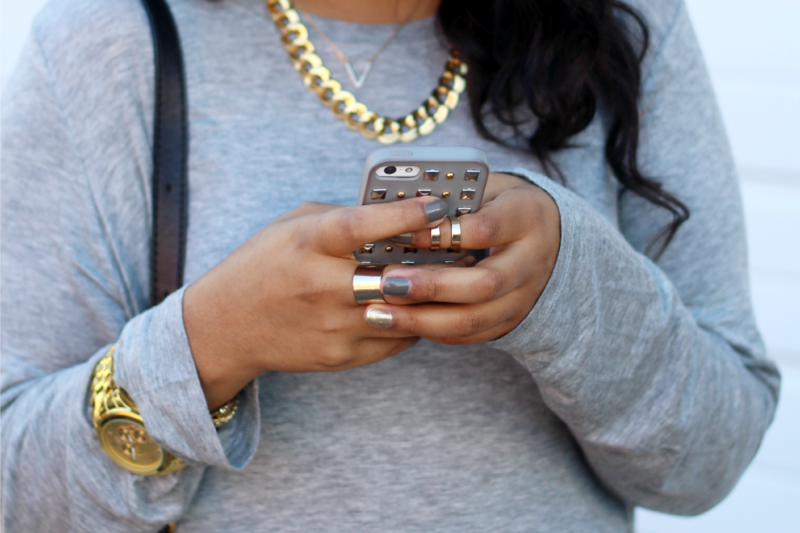 The gold accessories against the gray and black are a really cool touch. Have a great weekend, Audrey! Yes! Perfect outfit to welcome the weekend! I'm with you honey, TGIF! Have a great weekend. Amen to the weekend! I feel like lately, the weekdays are so hectic! The simple things are always the best things. They can always create a great look! first off let me say, your hair looks fantastic! Second I am loving that bold lip! I've been looking for a great pair of faux leather leggings! These ones are great, you look so fab! I adore your top, that looks so sleek and comfortable! I wish you a wonderful weekend! Girl this week suuuuuuuuuuuckkkkkeddddd for me too! So you are not alone!! Definitely ready for the weekend!! Absolutely obsessed with this look!!! Like everything about it!!! This week was the worst! You are looking fab though:) Love it head to toe. I guess so many people have similar things to say about this week but i already dread next week lol. Love the shoes and the whole outfit actually. These leather leggings look so cool! BTW< love the lip color!! Hope you are having a wonderful day! I love your lace top and putting your watch over it. That way, you always know what time it is. So smart!